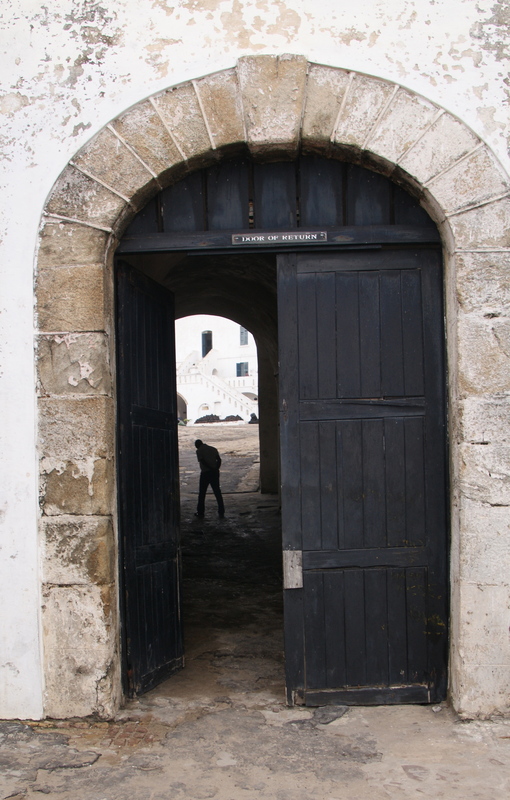 The sign affixed above the large double doors is a recent addition at the UNESCO recognized Cape Coast Castle. As are the large double doors, which replaced the rather smaller oppressive single door that existed until 1833, when thankfully the abolitionists succeeded in what can now been seen as a significant leap in human moral progress. Nevertheless this exit has been known by this name for centuries. This exit gives out to the Gulf of Guinea and the vast Atlantic. This shoreline, as is now well documented, was one point in the triangle of trade between Europe, Africa, and the America’s. Complete contemporary records are scarce, but it is estimated, that one and a half million African men and woman passed through this door, into a life of slavery. They were betrayed by their tribal leaders and adversities, commoditised for profit by merchants and exploited by their new owners at their final point of disembarkation. After a horrendous six-week sea journey, manacled and confined below decks they ended their journeys in Brazil, other parts of South America, the Caribbean, British and French Colonial North America and its successors, Canada and the United States. Those that were soon to become slaves will have arrived at this place, via ‘holding camps’ in dribs and drabs, either as prisoners of war from tribal conflict, or people that were traded so that a tribal leader, their leader, could obtain whisky, armaments, textiles, and other western goods. They were marked with red-hot branding irons and held in the dark dank dungeons like sardines. Up to 1000 men and 250 women crammed into these small lightless spaces. After residing for six weeks in these gaols they would find themselves wadding upto their knees in a mixture of their own effluent and the rainwater that flowed into the dungeon. Then every six weeks a ship arrived and they walked through that door, never to return to their families, their land. The stark, almost brutal, functional architecture of this edifice, its white washed walls (oh, the irony) together with its prominent position on the coast mean that it attracted me in fascination like a beacon. That word, ‘stark’, as a description, as a thought, never leaves me as I learn of the history of this place and undertake my journey through this structure, listening attentively to the castle guide. The tour takes us first to the male dungeons, four in total aligned side by side, each are designed to hold 250 men and are reminiscent of the worst kind of conditions in a modern battery farm. These cells are interconnected, lightless and dank. One of these dungeons is reserved for those men deemed to be dangerous and violent. Constructed in masonry, the exposed brickwork rises and curves to form a barrel ceiling, with a height at apex of perhaps 12ft and plan dimensions estimated to be approx 30ft long and 12ft wide. Channels cut in the stone floor formed an inadequate drainage system that leads nowhere. At one end of each dungeon is a small opening that sits internally at ceiling height and externally at castle yard height (ground level). These openings were created, not as a means of daylight for the captives, but as drainage points to alleviate the seasonal flooding that occurs within the castle courtyard, in this a land of rainforests. The openings are no more than eighteen inches long and four inches high and they let in a meager slither of light. As I stand there in the this dark, musty cavern and the sunlight weakens, I try to imagine what it must’ve been like to spend six weeks here, the floor slowly filling with effluent, almost knee deep. They would’ve slept standing and huddled together. Beyond a sense of horrendous despair and repulsion at the barbarism, the ugliness, it is impossible for me to imagine the plight of these captives. How can I? To do so would mean having a sense of the lives they led, their day to day existence. To understand their sense of disorientation, fear, loss and betrayal in their degraded circumstances. These men and women steeped in vodun (voodoo) beliefs would I imagine have wondered how they had angered their ancestors and spirits so that they ended up in this place, this plight. I cannot imagine, yet I am moved as I search for comprehension. 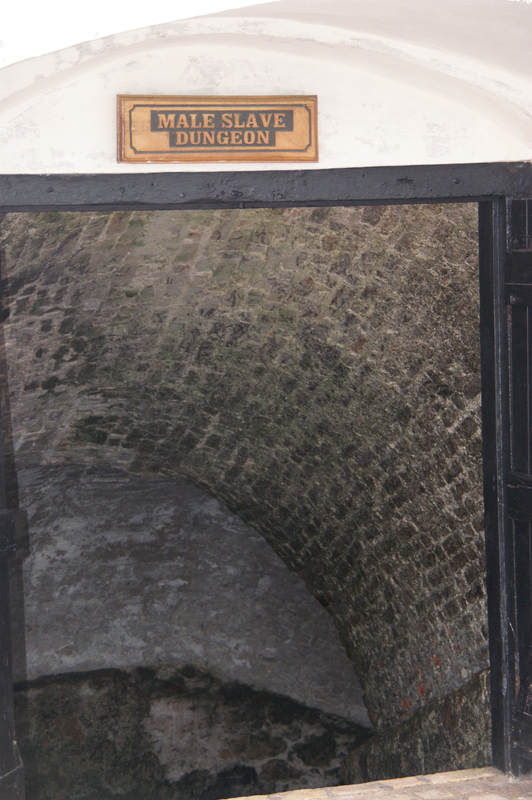 Further along this underground passageway, which was symbolically blocked up in 1833, the women’s dungeon is located. 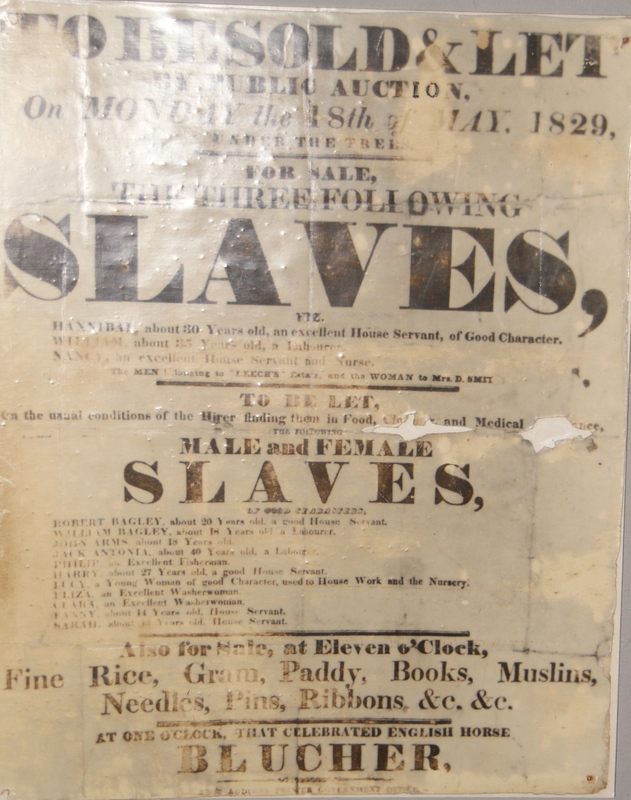 Though the number of female slaves held was far fewer, 250 were sent on each shipment, the conditions were undoubtedly far worse. In this dungeon there is no natural light and the floor was left to fill not only with rainwater and excrement, but also menstrual discharges. As our tour guide recites these facts I look at the faces of my fellow visitors, some with eyes filled with tears, all listening in stunned silence. In shock. Above the dungeons was sited the castle chapel. It is not long before the penny drops…. The slaves would’ve heard the sounds of worship from above them, the pious sounds of god fearing European barbarians who judged negros, niggers, blacks (take your pick) as a lesser species, ripe to be exploited. These people didn’t do irony. us to the Merchant’s Hall on the second floor. This is the business end of this facility. 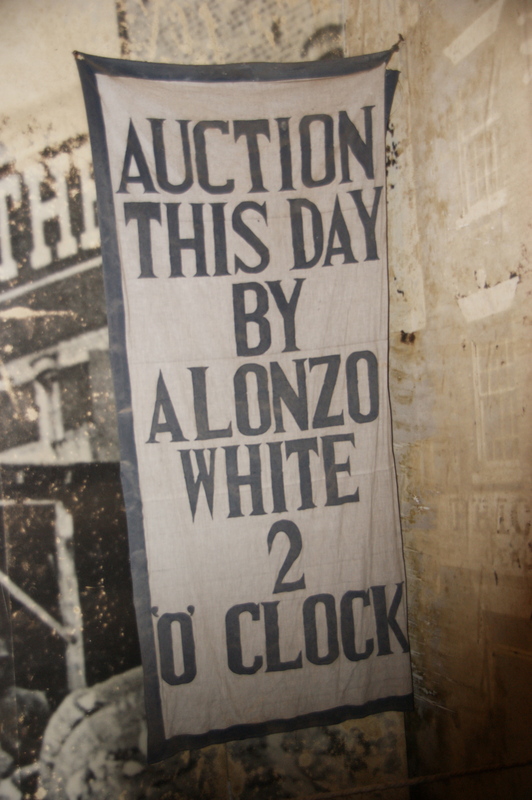 The large, expensively decorated room was where the auctions took place, trades were made, contracts entered into. No more than 200 feet from the dungeons, it is in terms of comfort of environment a world away, with the cosy feel of a club. Stark. We complete our tour by visiting the comfortable Governor’s quarters, we view the castle barracks and take time to absorb the excellent museum. As I leave, there is no doubt in my mind that building was designed as a factory, a machine for the ‘efficient’ conduct of slavery. It seems that wherever humanity exists so does slavery, certainly it is known that people from this part of West Africa were slaves in ancient Rome and in contemporary times we have examples of exploited Asian labourer’s working as indentured slaves on infrastructure projects for the 2022 Qatar World Cup and Pilipino women held as domestic slaves by affluent western families. While all of these instances are to be condemned and abhorred it is the scale of this particular trade that sets it apart. It is marked by the herrenvolken mentality that made it acceptable for those Europeans to brand fellow humans as a lesser breed, while giving these merchants respectability and wealth. 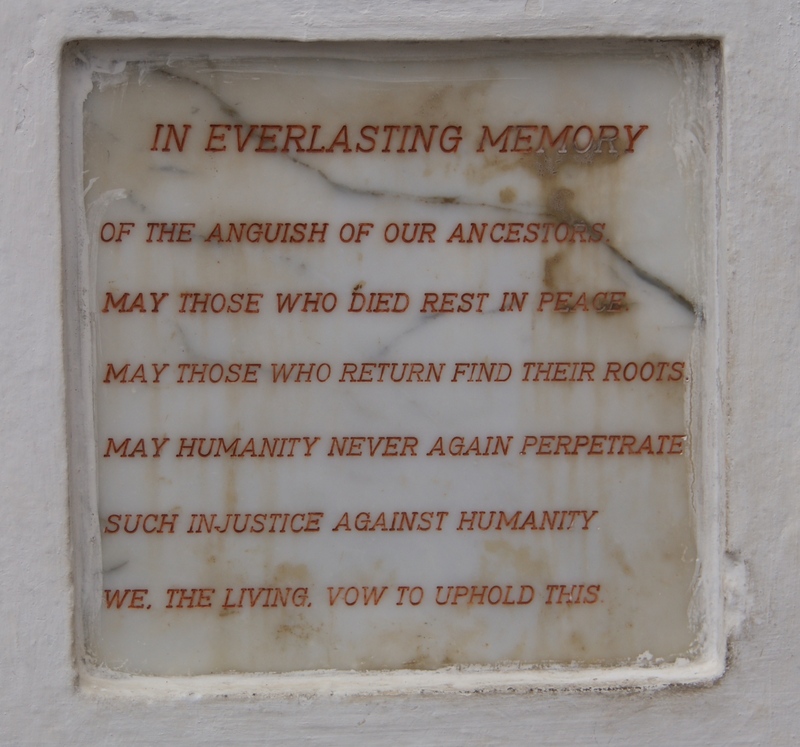 My experience was chilling; I will never forget this place and the stark (that word again) reminder it provides of man’s inhumanity to fellow man. 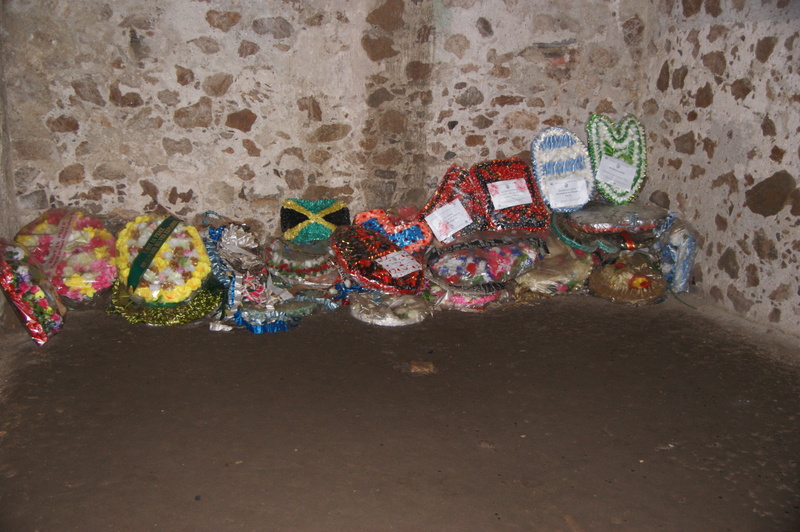 Since my visit I have spoken to several Ghanaians about my visit and I was struck, no shocked, by the view that several of them hold, that “their ancestors plight had given them (present day African-Americans) a better life” The clear implication being that over several centuries some karma had been restored. And thus, in present day Ghana, you feel the reverberations of a colonial past. From the odd uncomfortable greeting of “master’ that I receive, to the still prevalent perception in these parts that the white man is to be deferred to, that whatever words trickle from our lips are treated as gospel, to the perception that the US is the land of milk and honey where a better life exists. This later point, on comparative societies is a subject I hope to return to in a future blog. Ah Jack I love this blog! You certainly retained a lot more information than I did upon visiting the place so it’s very satisfying to have a refreshment of all the info direct from you! Your end point is certainly the most interesting and chilling. There is some sort of engrained respect or tainted awe that a lot of the countrymen have for white people, like them calling us ‘master.’ Many feel inferior and it’s so hard for us to understand why?! Looking forward to continuing to follow your expedition around Africa and beyond! Thanks Dan for the compliments. I’m delighted that you enjoyed my post. Stunning read…always shocked by the depths of depravity human beings can sink. Also shocked by the fact there isn’t much more ill-feeling towards the people (and ancestors) who carried out these atrocities. Thankfully, they seem to have goodwill and forgiveness in their hearts. However, I believe they need to greet and treat the white man as equals for them to be truly free from the shackles of history. Excellent stuff Jack, fascinating! Looking forward to reading more! Graham, I thought I’d responded before now, but the joys of internet in these remote places we find ourselves! Just briefly this time… you have of course hit the nail on the proverbial with your comments about the trade off between two very different societies. I hope to be able to tackle this is greater detail with a further blog, but fear my observations will not get very deep into the subject, which properly requires more than a few months of living here to do it justice. Perhaps once I’ve been all around Africa I’ll be wiser and be able to do it a modicum of justice.